Note: Bob Estreich passed away in 2011. His family presented all his documents and other items to the Australasian Telephone Collecrors Society Inc. Amongst the items was a copy of Bob's web site "bobsoldphones.net". With the Estreich family's permission we are endeavouring to load this most important resource onto the ATCS website. The information comes from a July 2008 backup of the Bob's web site. Changes and corrections may have been made since that date and we will endeavour to update the site as later information comes to hand. If you find any errors, particularly with links, or know of any updates, please notify the ATCS Editor. Hi. 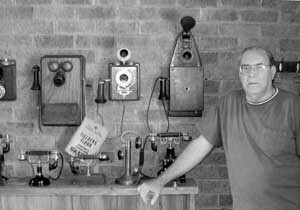 My name is Bob Estreich, and I collect, research and write about old telephones and their history as a hobby. I got into this hobby through working for Telecom Australia for many years, through the modernization which gave Australia a completely automatic system by the mid 1990s. During the twenty two years I worked for Telecom I saw many old phones being scrapped because they had outlived their usefulness. I began a collection, and I am grateful to the many technicians and linesmen who put phones and phone parts aside for me. Some of the old phones being destroyed had been in use for over sixty years and it was rather sad seeing them thrown out after such good service. In some ways, this website is my way of saying "thanks" for all your help. For some years now I have been writing the occasional article for the Newsletter of the Australasian Telephone Collectors Society, and researching these articles has given me a new interest in the collecting area. In this website I will try to pass on some of the information I have gathered over the years, and from time to time I will seek information on the areas I am researching. I will be grateful for any help, comments, pictures or whatever. As the information comes together, I will publish it on this website so it's there for reference. Unfortunately a previous website I had crashed (and it turned out that it wasn't backed up). Hopefully I can do a better job with this one. Although this site will tend to be oriented towards Australia and New Zealand, I hope the information will be just as useful to collectors in the countries that used similar phones. I will concentrate mostly on the history of the companies that built the phones, with enough examples for you to identify your phone. The website is optimised for Internet Explorer, 1024 X 678. I used broadband, but most of the pictures are fairly low-res for speed of download on a dialup connection. They are not great quality, since they mostly come from catalogs, but they should be useful to identify a phone. If you have one of the phones in your collection, and you have a good photo, feel free to send it to me and I will replace the photo on this site. As higher-speed internet spreads, higher-res pictures will be more practical. Your browser may give you a popup message about some content being blocked - that's OK, it's just the frame setup on each page. You can allow it to proceed while you are on this site, or you can leave it blocked - blocking it will just screw up some of the page layout a bit. Some older versions of browsers may be set to block frames - turn frames back on for best results. It's in the Advanced settings of Internet Explorer. This website and its contents are copyright to me except where noted. Permission is given to quote from or reprint from this site for collectors, and for non-commercial use, provided you acknowledge the source. The pictures come from many sources, and I have lost the references for some of them. If I have inadvertently used a picture that is copyrighted to you, please let me know and I will acknowledge it or remove it. Feel free to link to this site from your website if it is useful to you. Where possible I have tried to get the information from primary sources such as catalogs, telephone company instructions, technical publications from the period, etc. The information contained herein is as accurate as I could get at the time of posting it, but it may contain errors that will show up with time and more research. I accept no liability for loss or damage due to errors, and you use this website subject to that condition.